French Metal doesn’t get a lot of attention outside their country, in my opinion. Obviously GOJIRA and ALCEST immediately jump off the tongue when asked about what well-known Metal bands hail from France and while there is nothing wrong with those acts, how many Death Metallers (outside France) remember MISANTHROPE or VULCAIN? Say “NINE INCH NAILS” and almost everyone within six blocks in any direction knows exactly who you are talking about, but does anyone know of TREPONEM PAL? They actually predate NIN by two years! I fear I’m getting off topic. THE WALKING DEAD ORCHESTRA is another French Metal band that doesn’t get enough of the attention it should, is my point. “Resurrect” begins with atmospheric horror, radio static and Jurassic Park T-Rex level bass tromping forebodingly across with the clear intent to kill. The portentous atmosphere is then cut with a knife in “Resurrect the Scourge” which immediately jumps out and gang rushes the senses with nerve fraying energy. Florian Gatta’s foaming blood vocals churn in a biting piranha whirlpool of scorching frets. THE WALKING DEAD ORCHESTRA bellows their call to arms and readies for the impending siege and slaughter in “Through the Realm of Chaos” and unleashes their full attack in “Vengeful Flavors”. Drum beats fire off at Gatling gun frequency, basslines snake through barbed enemy lines, it is an all-out fight to win with “Resurrect”. “Necrosphere” permeates the air with dissonant chords and unprecedented aural bloodshed. There is an unrelenting violence in THE WALKING DEAD ORCHESTRA that is all but impossible to ignore. 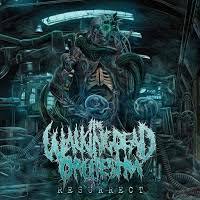 “Resurrect” is the final polish of the band’s voice since the release of their bone-splintering debut “Architects of Destruction” back in 2013. “Resurrection” is far angrier, meaner with better, deeper growls and crisper production. THE WALKING DEAD ORCHESTRA is ready for the assault, the question is, are you?